I would like everyone to know that my wonderful husband, Frederick Allen Holliday II, died on Wednesday the 17th of Renal Cell Carcinoma. He was great. He was kind and caring. He was a loving father. He was a brilliant teacher. He did not deserve to die in such a cruel way. Cancer is a monstrous disease that eats you alive. I cared for my husband for the last three months. My mother-in-law says that I am what kept him alive during his very long hospitalization. We spent three months in five different hospital settings. I saw some very good care and too often, very poor care. I found out things I had never wanted to know. I discovered how bad it can get when you are hospitalized in this country. I did not ask to be handed this cup; I will drink from it, though. I will let the anguish of us all pour out through me. I will be his voice. I will be your voice. We are all patients in the end. We should have the right to be treated with dignity and respect. Up until now, we have only seen skirmishes. I have been waiting to begin the battle. Now I gird for battle. I am a liberal democrat raised in Oklahoma by conservative republicans. I am a Lutheran whose best friends represent many faiths. 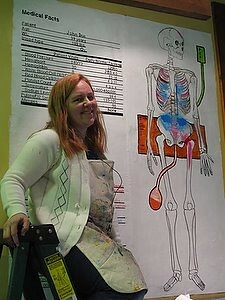 I am a mural artist in Washington DC and was Oklahoma State Champion in Original Oratory in 1990. I have worked in a factory, in food service, in retail, as a teacher, and served briefly in the US Navy. I am a mother of a special needs son and am the widow of a good man. I am the perfect storm. My mother was a hospital house-keeper and my Aunt Minnie an ICU nurse. They always told me to go into medicine. Now, I will go after medicine. As a child, I was abused. I lived in a society where people looked the other way. My mother and my aunts did their best to help in a very bad situation. I went to teachers and told them the horror of my life at home. They did nothing. People saw me beaten in public and did nothing. Neighbors heard my screams. They did nothing. At 17 years old, I took my younger sister to a shelter. In so doing, I think I saved us all. Today we live in a society that looks the other way. The health care system is abusive. People say "that's just the was it is" and we have to live with it. I say no. If there is a societal shift, things will change. Now if a child is beaten, it is not okay. If a teacher hears of an incident, by law they must report it. I want the same awareness and laws in health care. This week I will start my next mural. I will be painting at the Amaco Station by Politics and Prose. Look for me. Look for the change that will come. I ask for your help. Do battle with me. If we all work together we will effect great change. Not I amongst the rose. Weighted garlands on my chest. To mulch the cactus on my back. Standing out amongst the dead. The reason why I lived my life. As did our love in life's twilight. let them grow and let them seed. Except for he who was most dear. Not I amongst the rows. Plant me not in groves of dead. But far away in some mind's eye. I began the design of the new mural. It is Guernica meets The Death of Marat as designed by me channeling a little Diego Rivera. Watch for The 73 Cents Movement coming to a wall near you. 1. You have the right to access your medical record without monetary charges. You have the right to an electronic copy of your medical record also without charge. Anything you say or suggest during consultation would enter the medical record. You have the right to review said record with providers of care and make appropriate changes where inaccuracies are found. 2. You have the right to a medical advocate present during consultation. The said advocate could be a family member or friend or professional in the field. If you do not have access to an individual who can act as an advocate, an unbiased advocate will be requested for you. 3. You have the right at any time to stop consultation, and request a second opinion of another Doctor. You have the right to secure the doctor of your preference, and in the instance of a bedridden status, see a doctor without `privileges' or out-of-network while in a hospitalized setting. 4. Do you understand your rights as a patient? Now is the time to call your congressman and demand your rights. The law is being made now. Do not be left out. Check out this article from Cindy Throop. 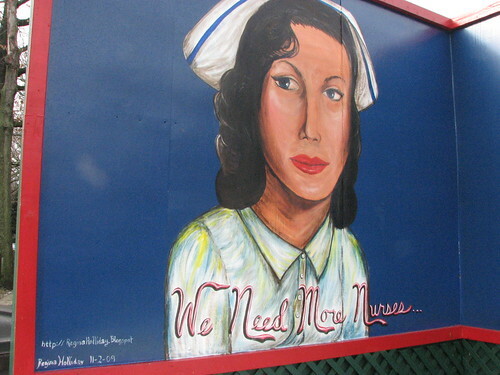 She show pictures of the mural and mentions the reasons for our medical advocacy. Together we are going to change things!